Kelfer Studios offers a collection of cabinet knobs and pulls in a number of botanical designs. Knobs are individually cast in bronze and offered with a rich hand rubbed patina finish or 22k gold, rhodium or nickel plate over bronze. Each cabinet knob can be further customized with unique bezel-set gems. 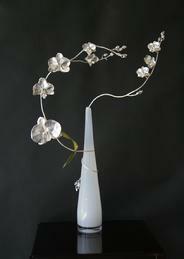 Our metalwork sculptures focus on botanical themes. We hand craft each of our creations from silver, bronze, and copper metals and finish them in patinas, enamelwork or 22k gold or rhodium plate. We combine the ancient techinques and tools of chasing and repouse, silver smithing and lapidary work with modern tools of jewelry fabrication to build each detailed piece. We knew we were going in the right direction when after we had finished one of our first orchid sculptures, a hummingbird flew into our open window in Malibu, perched on our oncidium sculpture and "sat a while" contemplating lunch. Kelfer Studios presents a collection of contemporary jewelry in gold, silver, pearls and precious stones.